Three charts from the latest Morning Consult Midterm Wave Watcher data show uneven waters for Democrats hoping to ride a blue wave into control of Congress. On the Senate side, over the past year, voters have steadily lost confidence in most of the Democrats defending their seats in close elections on Tuesday, according to the data, based on 388,720 surveys with registered voters across the country from Aug. 1 through Oct. 30. 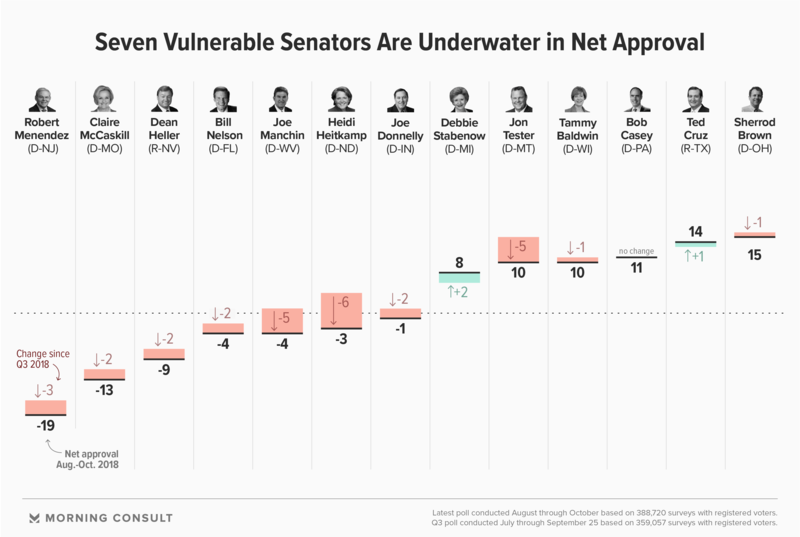 Most of the vulnerable senators have seen their approval drop over the course of the year, and seven of the 13 now underperform the net approval of President Donald Trump in their states. Democratic Sens. Bill Nelson in Florida, Heidi Heitkamp in North Dakota and Joe Manchin in West Virginia have seen particularly sharp drops since the last quarter of 2017. 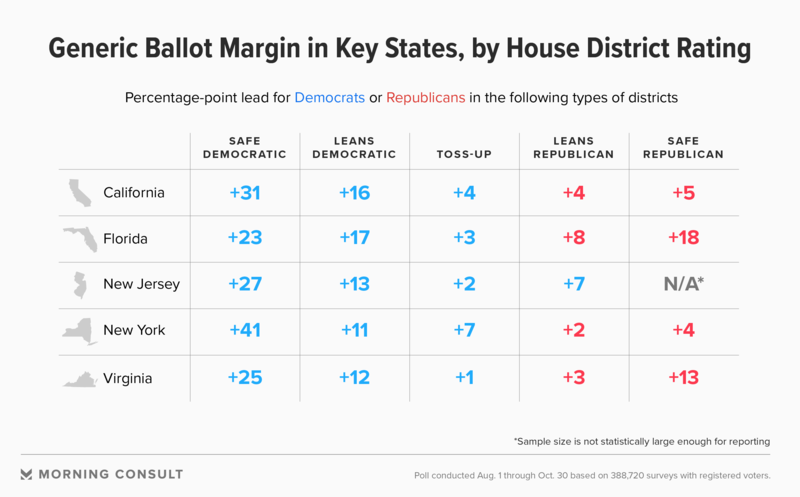 On the other side of the Capitol, generic ballot data shows Democrats hold a 7-point lead over Republicans in toss-up House races that are traditionally closely split between the two parties. While the data provides only a broad view of the election and not a head-to-head comparison of specific candidates, it underscores the large swath of territory Republicans are struggling to defend. There are dozens of GOP-held seats that are classified as toss-ups, and Democrats only need to net a 23-seat gain to retake the majority. Democrats also have a slight advantage over the GOP in Republican-leaning districts in Illinois, Indiana, Kentucky, Washington and Wisconsin. 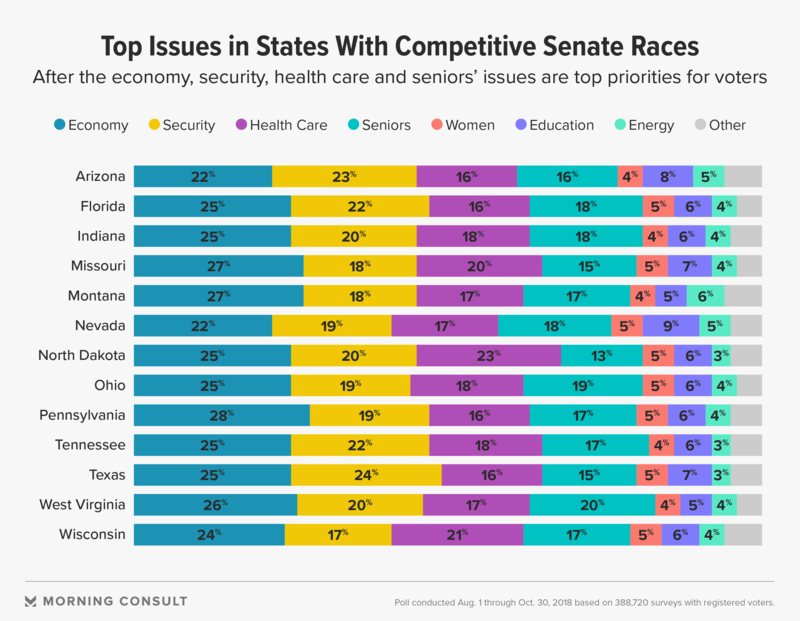 When it comes to what voters care about, economic issues predominated in most states — an issue where neither party has a decisive advantage, according to national Morning Consult/Politico polling. For example, the latest Morning Consult/Politico survey showed 44 percent of registered voters trusted the GOP’s handling of the economy, 5 points higher than the share who opted for Democrats. That’s less than half the 11-point edge the GOP holds over Democrats on national security issues. And Democrats dominate when it comes to health care, where they lead Republicans by a 14-point margin. Health care was a top issue in states that have seen a debate about pre-existing conditions or Medicaid work requirements, including North Dakota, Wisconsin and Missouri. Democratic voters may be particularly receptive to those topics as nationwide, they are just as likely to prioritize health care as economic issues.